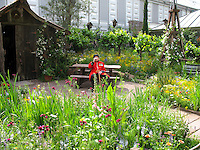 Stock Images from the most famous flower show in the world, the Royal Horticultural Society's Chelsea Flower Show in London, England, where top garden designers vie for Gold Medal awards. Stunning garden landscapes, garden details, plant closeups, and more. We have thousands of stock pictures from a decade of photographing the show gardens.